This is the ninth post in a series about my possible line of descent from Eleanor of Aquitaine. In the first post, I explained how I discovered the possible line, and how I am going to verify it one generation at a time. In the last post, I proved that my fourth great-grandfather Laurens Smulders was the son of Hendrik Smulders. 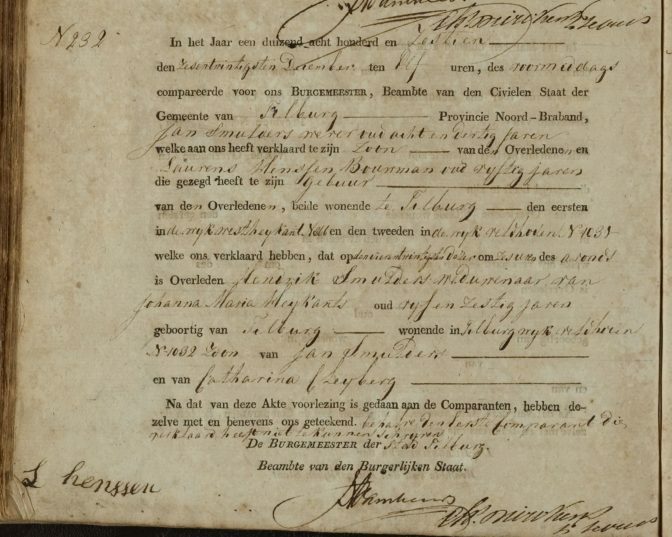 In the last blog post, I briefly discussed the marriage and death record of Hendrik Smulders, who married in 1777 and died in 1816, that provided evidence for the identification of Laurens as his son. In this blog post, I will analyze the records more deeply to see what evidence can be found in them about Hendrik’s own parents. His son would have been familiar with the family and would probably have known his grandparents’ names, even though he was not there when his father was born. Hendrik was listed in the death duties overview of deceased persons for whom no death duties file was created.2 This usually indicates that he left no real estate. Knowing if people owned real estate can be used as indirect evidence for parentage, if the property was inherited. The name of the groom, “Hendrikus Jan Smulders,” indicates that he was the son of Jan. In this period in Brabant, people used patronymics without the distinctive -s or -sen (Jans, Jansen) that was common in other areas. His brother Johannes was called Johannes Jan Smulders, confirming that “Jan” was a patronymic. Their patronymic Jan matches the name of Hendrik’s father according to his death record. The civil record indicates that Hendrikus and Johanna Maria were both Roman Catholic. In this period, Roman Catholic marriages were not recognized by the civil authorities. They had the choice of marrying before the aldermen’s court or before the Dutch Reformed Church. Like many Roman Catholics, they chose the court for their civil ceremony and then married in the Roman Catholic Church afterward. 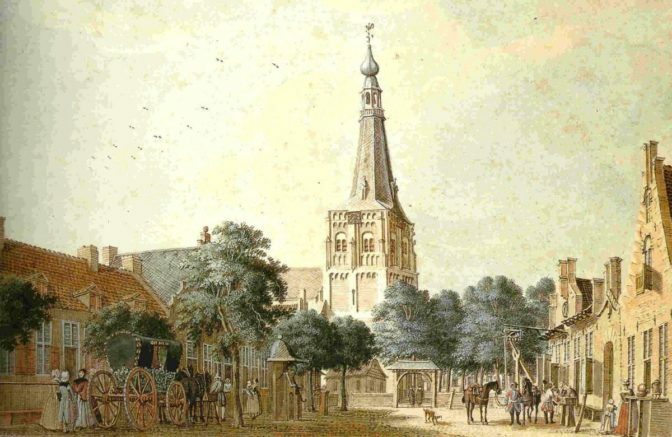 Henricus, legitimate son of Joannis Smulders and Catharina Clijenbergh was baptized in the Roman Catholic St. Dionysius Church in Tilburg on 14 July 1752.6 Apart from latinization of the first names and a minor spelling variation in the last name of his mother, the names of the child and parents match the information from Hendrik’s death record. If he was baptized a few days or weeks after he was born, he would have been almost 25 or just 25 when he married, consistent with the age of 25 in his marriage record. This baptism was the only baptism of a Hendrik, son of Jan Smulders and variations in Tilburg between 1745 and 1760. 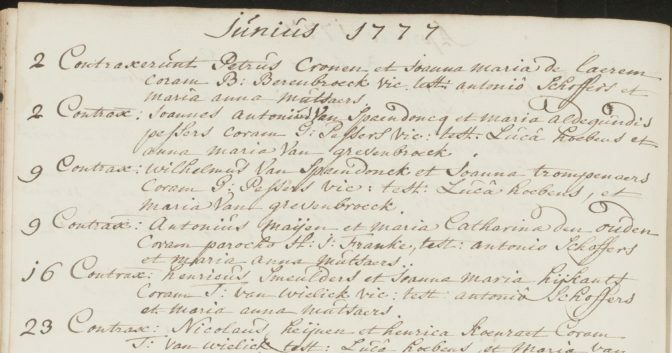 Smulders, Jan, and Hendrik are all common names in Tilburg, and other children named Hendrik, son of Jan Smulders were baptized in 1738, 1740, 1762, and 1765. None of them had a mother named Catharina Cleijberg or variations, and none of them were of an age to be the 25-year-old groom in 1777, so these are clearly different people.7 Knowing about these same-named men is useful when searching for other records, since additional information will be required to identify a Hendrik Jan Smulders in a record. Joannes, baptized 20 September 1778 (witness: Aldegundis Smeulders). Three of the witnesses were called Smeulders: Aldegundis, Petronilla, and Maria Catharina, suggesting a close family relationship to Hendrik Jan Smulders. Their names match three daughters of Jan Smulders and Catharina Cleijberg: Aldegundis, baptized in Tilburg on 24 November 1755,9 Petronella, baptized in Tilburg on 10 June 1758,10 and Maria Catharina, baptized in Tilburg on 10 January 1761.11 Hendrik’s sisters would have been a logical choice for baptismal witness. 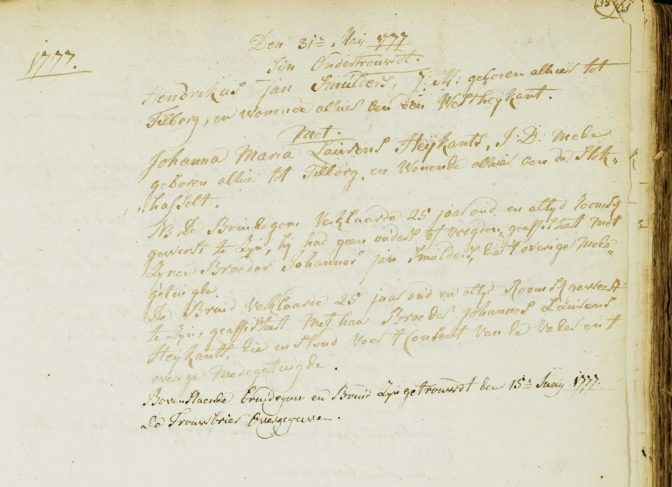 Jan Smulders and Catharina Cleijberg also had a son Joannes, baptized in Tilburg on 29 May 1750.12 His named matches the name of the brother Joannes Jan Smulders who witnessed Hendrik Jan’s marriage in 1777. The naming patterns also support the theory that Hendrik Smulders is the son of Jan Smulders and Catharina Cleijberg. 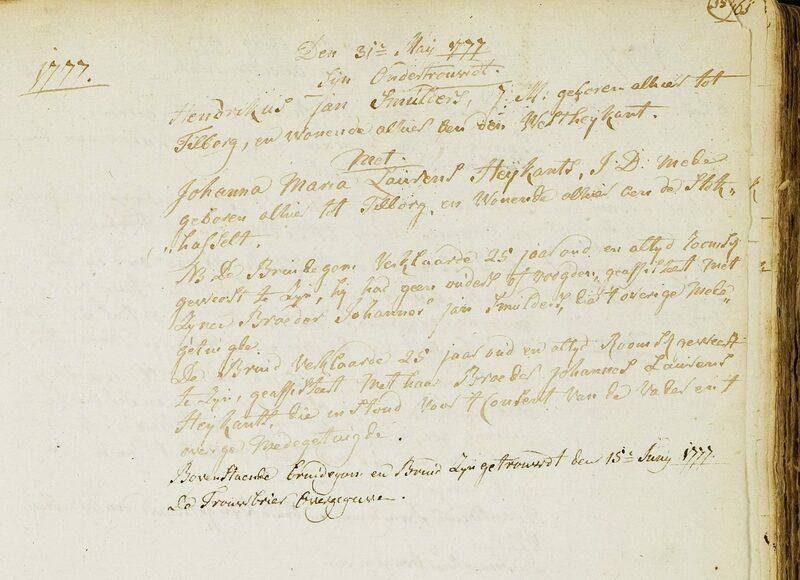 Hendrik named his first son Joannes, the Latin form of Jan, and his first daughter Maria Catharina, apparently after his mother Catharina Cleijberg who was called Maria Catharina in the baptismal record of her son Cornelius in 1799. Hendrik Smulders appeared in the 1810 census as “Henri Smulders,” together with his sons Nicolas and Antoine and daughters Marie Catrine and Gerardine. The previous blogpost explains how the family composition proves this is the entry for this Hendrik Jan Smulders and not one of his namesakes. His residence in Oosterheijkant matches the district where his wife died in 1799. Her death explains her absence from the household in 1810. Hendrik was illiterate: in 1814 he declared to be unable to write when his daughter Maria Catharina married.16 Illiterate people were less likely to know their exact age since they had no access to family records, and were more likely to round off their age when asked. This may explain why Hendrik gave his age as 60 rather than 58, the age calculated from his apparent baptismal date. 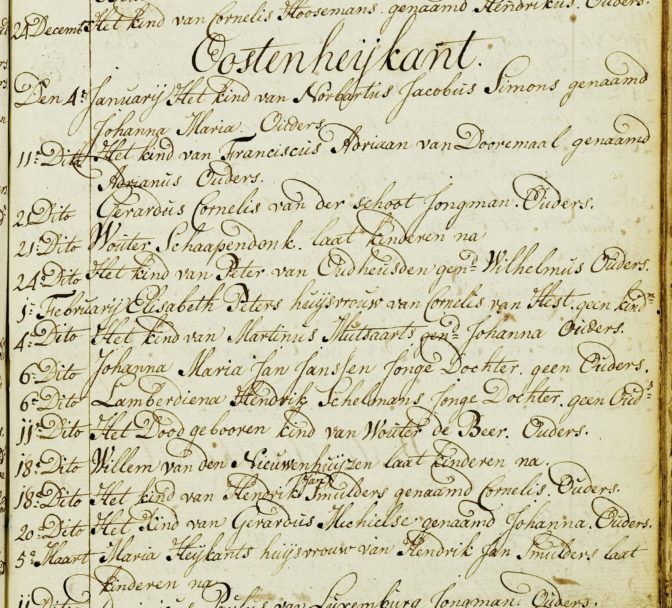 The index of court and notarial records of Tilburg showed no other records that had Hendrik Jan and Jan Hendrik Smulders in the same record.17 Because there were so many men named Hendrik or Jan Smulders in Tilburg, and there was sufficient other high-quality evidence for the parents of Hendrik Jan Smulders, records that only had one of these names were not consulted at this time. Hendrik Smulders is the most distant ancestor for whom there were civil registration records available, since he died after the introduction of the civil registration in 1811. His 1816 death record named Jan Smulders and Catharina Cleijberg as his parents. A 1752 baptismal record showed that they had a son Hendricus of approximately the right age to be the man in the death record and the 25-year-old husband in the 1777 marriage record. The marriage record and burial record of Hendrik’s wife confirmed that his patronymic was Jan, which matched the name of his father. Connections with family members provided additional evidence to support the conclusion that Hendrik Smulders was the son of Jan Hendrik Smulders and Catharina Cleijberg. They had daughters Aldegundis, Petronilla, and Maria Catharina; names that also appeared as witnesses to Hendrik Smulders’ children. And they had a son Joannes, matching the name of the brother who witnessed Hendrik Smulders’ marriage. Apart from minor discrepancies in ages and names, all evidence is in agreement that Hendrik Smulders was the son of Jan Smulders and Catharina Cleijberg. No evidence was found to contradict this conclusion. That’s eight generations down, twenty to go! Next up: Generation 9 – Jan Smulders. 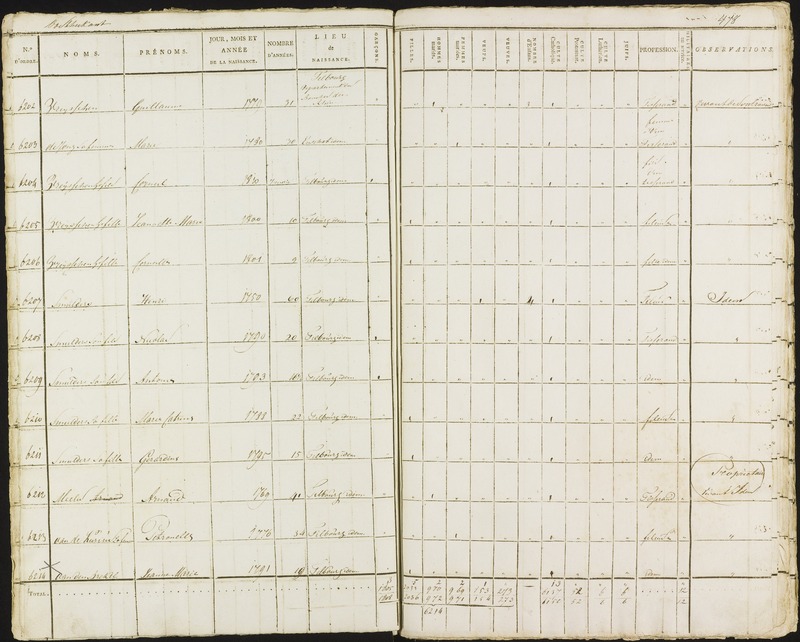 Civil Registration (Tilburg), death record 1816 no. 232, Hendrik Smulders (26 December 1816); “Zoek een persoon,” index and images, Regionaal Archief Tilburg (http://www.regionaalarchieftilburg.nl : accessed 11 December 2017). 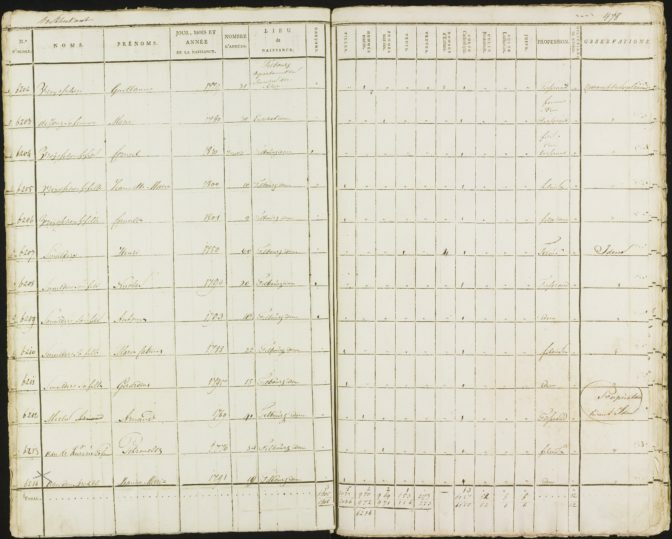 Death Duties Office (Tilburg), register of deceased who died but have not done a declaration, entry for Hendrik Smulders (24 December 1816); Brabants Historisch Informatie Centrum (BHIC), Den Bosch; scan provided by BHIC. Aldermen’s Court (Tilburg), marriage register 1772-1787, p. 159, Smulders-Heijkant (31 May 1777); “Zoek een persoon,” index and images, Regionaal Archief Tilburg (http://www.regionaalarchieftilburg.nl : accessed 7 May 2016). “Heikese kerk,” Tilburg Wiki (http://wiki.regionaalarchieftilburg.nl/Heikese_kerk : version 22 June 2017). 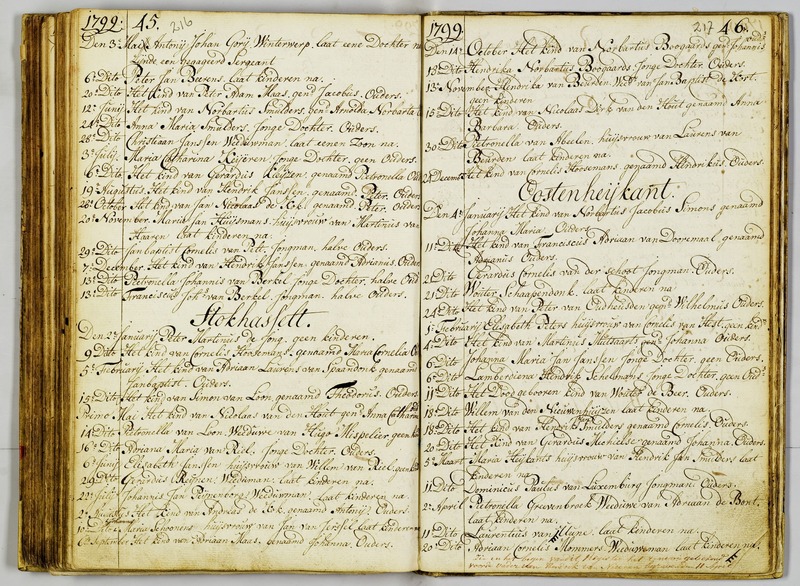 ‘t Goirke Roman Catholic Parish (Tilburg), baptismal register 1762-1890, Smeulders-Hijkants (16 June 1777); “Zoek in registers,” browsable images, Regionaal Archief Tilburg (http://www.regionaalarchieftilburg.nl : accessed 9 March 2018). St. Dionysius Roman Catholic Church (Tilburg), baptismal register 1741-1756, unpaginated, Henricus Smulders (14 juli 1752); “Zoek een persoon,” index and images, Regionaal Archief Tilburg (http://www.regionaalarchieftilburg.nl : accessed 7 May 2016). “Zoek een persoon,” index, Regionaal Archief Tilburg (http://www.regionaalarchieftilburg.nl : accessed 11 December 2017), search for eerste persoon [first person] hen* sm*lder* as kind [child] and tweede persoon [second person] j* sm*lder* as vader [father]. St. Dionysius Roman Catholic Church (Tilburg), baptismal register 1775-1810; “Zoek een persoon,” index and images, Regionaal Archief Tilburg (http://www.regionaalarchieftilburg.nl : accessed 11 December 2017). St. Dionysius Roman Catholic Church (Tilburg), baptismal register 1741-1756, Aldegundis Smeulders (24 November 1755); “Zoek een persoon,” index and images, Regionaal Archief Tilburg (http://www.regionaalarchieftilburg.nl : accessed 11 December 2017). St. Dionysius Roman Catholic Church (Tilburg), baptismal register 1757-1775, Petronella Smeulders (10 June 1758); “Zoek een persoon,” index and images, Regionaal Archief Tilburg (http://www.regionaalarchieftilburg.nl : accessed 11 December 2017). 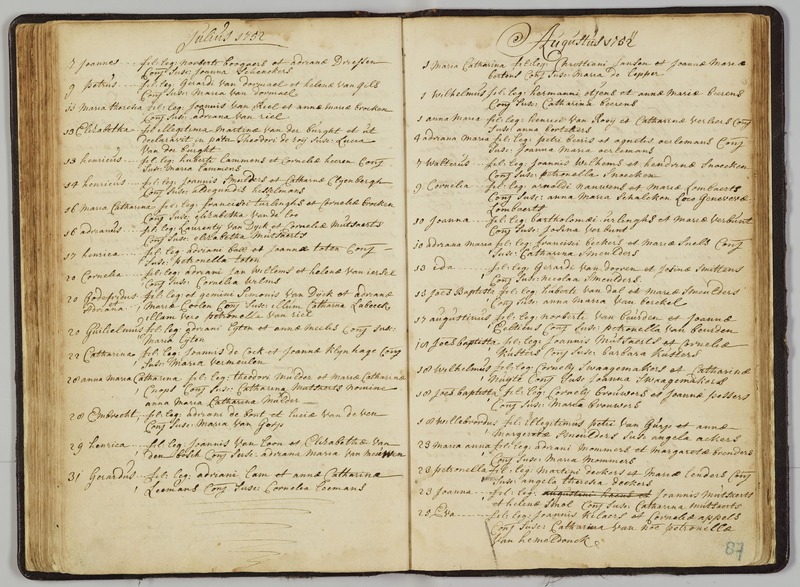 St. Dionysius Roman Catholic Church (Tilburg), baptismal register 1757-1775, Maria Catharina Smeulders (10 January 1761). 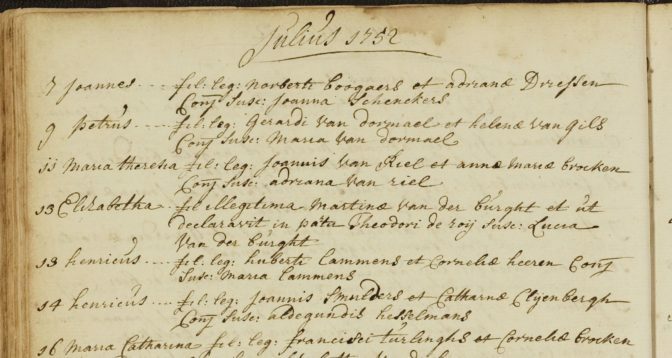 St. Dionysius Roman Catholic Church (Tilburg), baptismal register 1741-1756, Joannes Smeulders (29 May 1750). Dutch Reformed Church (Tilburg), marriage register 1746-1759, p. 97, Smulders-Klijberg (27 April 1749); “Zoek een persoon,” index and images, Regionaal Archief Tilburg (http://www.regionaalarchieftilburg.nl : accessed 7 May 2016). 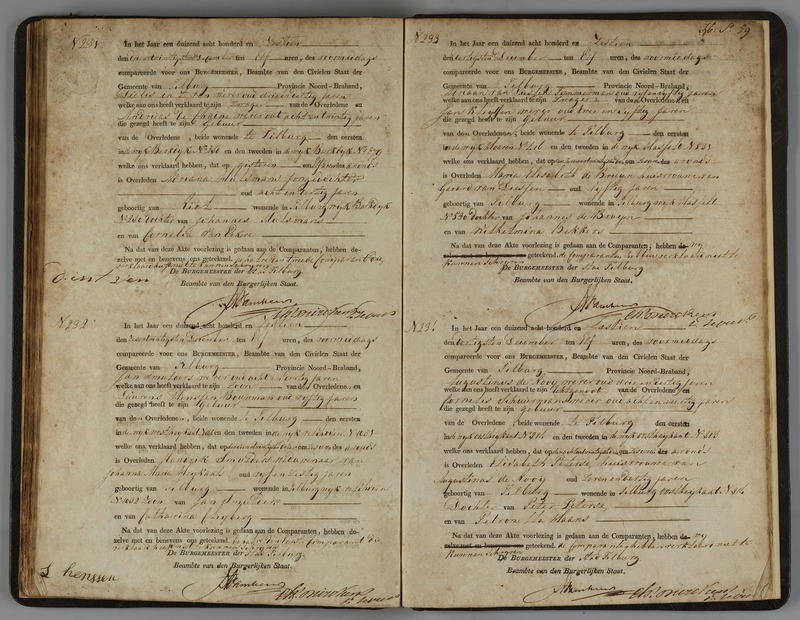 Dutch Reformed Church (Tilburg), register of burials 1783-1803, fol. 46, Maria Heijkants (5 March 1799); “Zoek een persoon,” index and images, Regionaal Archief Tilburg (http://www.regionaalarchieftilburg.nl : accessed 3 December 2017). Tilburg, 1810 census, vol. 2, p. 478, entries 6207-6211, household of Henri Smulders; “Zoek een persoon,” index and images, Regionaal Archief Tilburg (http://www.regionaalarchieftilburg.nl : accessed 7 May 2016). 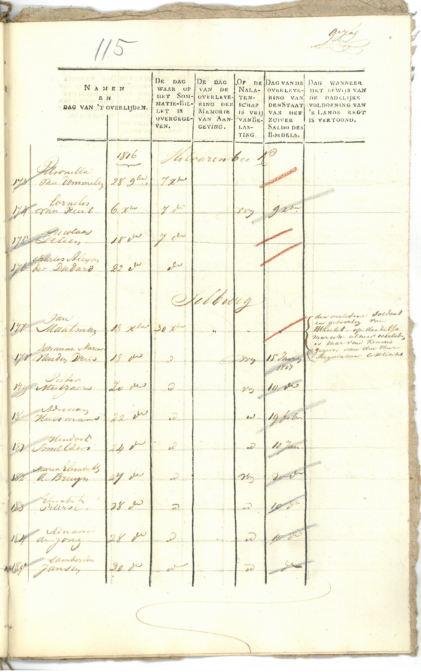 Civil Registration (Tilburg), marriage record 1814 no. 57, Niesten-Smeulders (24 August 1814); “Zoek een persoon,” index and images, Regionaal Archief Tilburg (http://www.regionaalarchieftilburg.nl : accessed 10 December 2017). “Zoek een persoon,” index, Regionaal Archief Tilburg (http://www.regionaalarchieftilburg.nl : accessed 11 December 2017), search for J* H* Sm*lder* in “akte” [record]. Interesting to learn about the patronymic. I would have thought it was just a middle name. Yes, this can be misleading. You’re clearly having fun with this! It will be interesting to see how it comes out with records harder to come by as you go back in time. I’m still rooting for Eleanor! Thanks, me too! And yes, ‘m having a lot of fun doing the research and writing the series. So far, so good, but keep checking to see if you agree with my findings. Keep me sharp! Yvette, are the records you refer to on the internet eg census and civil registration documents? Almost all of these records were found online. If you check the source citations you will see that most were found on the Regional Archives of Tilburg website.